“Amdahl's Law in the Multicore Era” Mark Hill and Mike Marty University of Wisconsin IEEE Computer, July 2008 Presented by Dan Sorin. 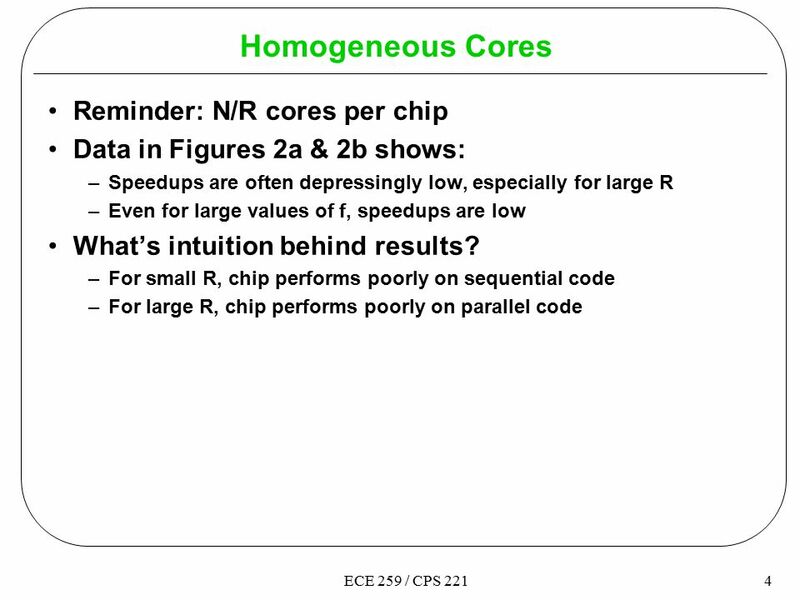 6 6ECE 259 / CPS 221 Somewhat Obvious Next Step If homogeneous isn’t great and heterogeneous isn’t always great, can we dynamically adjust to workload? 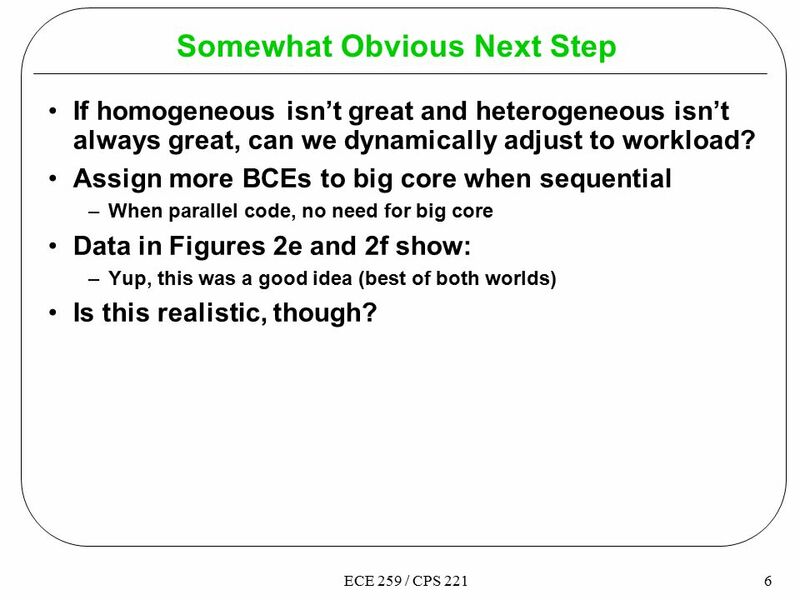 Assign more BCEs to big core when sequential –When parallel code, no need for big core Data in Figures 2e and 2f show: –Yup, this was a good idea (best of both worlds) Is this realistic, though? 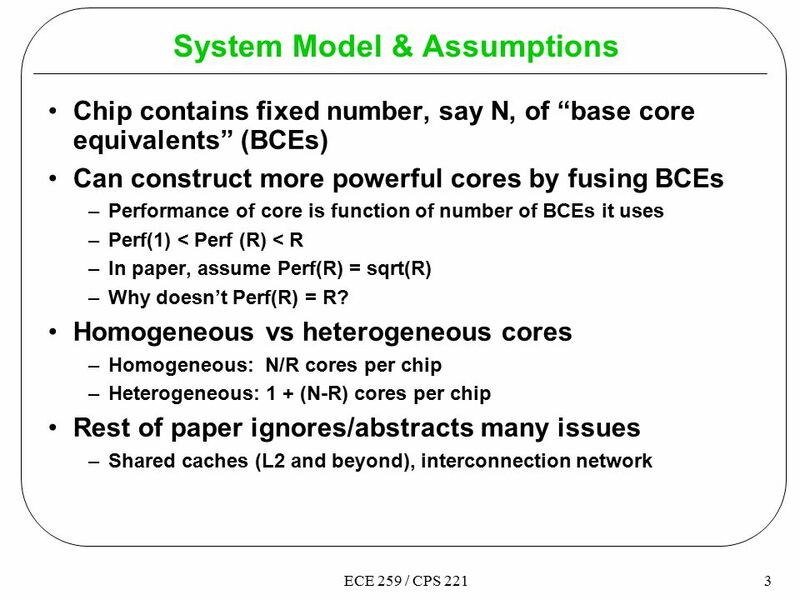 8 8ECE 259 / CPS 221 Questions/Concerns Is this model too simplistic to be insightful? 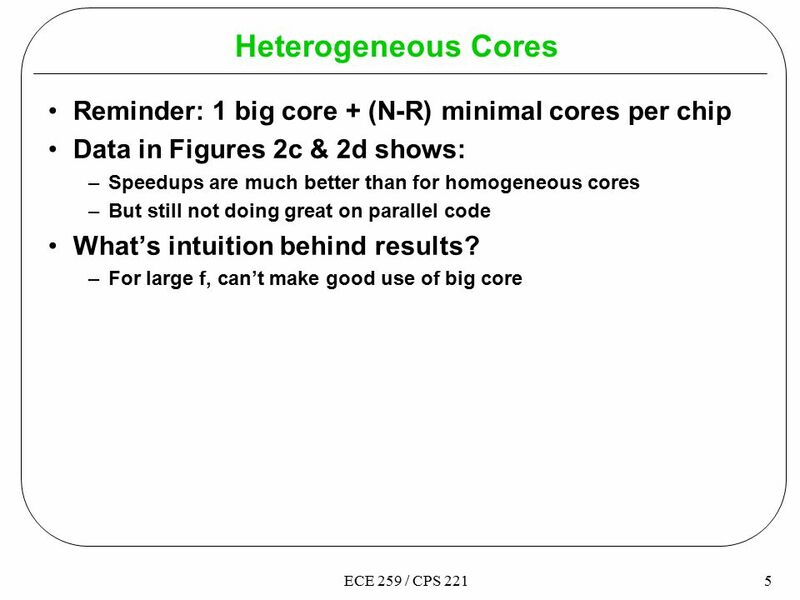 –Abstractions can be good, but can also be misleading –For example, this paper focuses on cores, when the real action is in the memory system and interconnection network –Concrete example: more cores require more off-chip memory bandwidth  having more cores than you can feed isn’t going to help you Are the overheads for dynamic reconfiguration going to outweigh its benefits? –CoreFusion paper does this, but it ain’t cheap or easy What if breakthrough in technology (e.g., from Prof. Dwyer’s research) removes the power wall? –Do we go back to big uniprocessors? 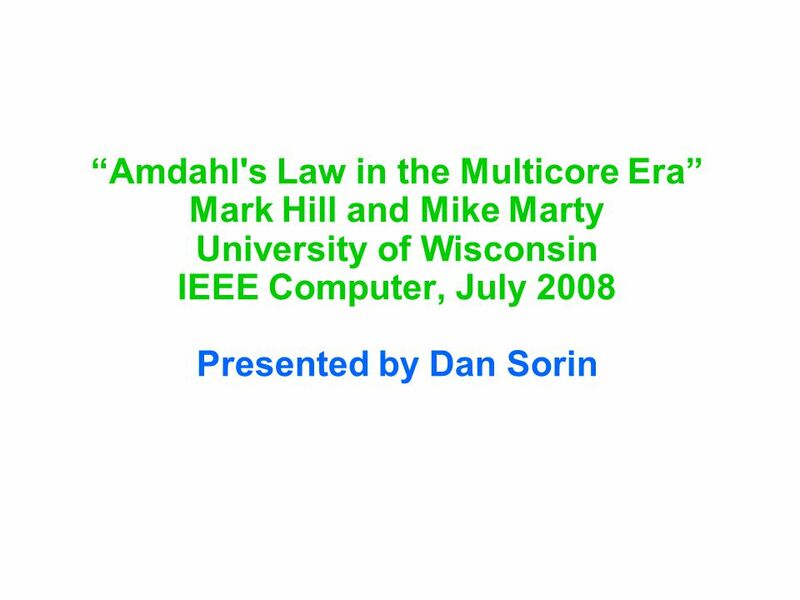 Download ppt "“Amdahl's Law in the Multicore Era” Mark Hill and Mike Marty University of Wisconsin IEEE Computer, July 2008 Presented by Dan Sorin." Analyzing Parallel Performance Intel Software College Introduction to Parallel Programming – Part 6. Farewell Argument Paper Weeds & Roses. Why this weeds and roses is extremely important:  You are likely to have concerns, comments, questions, gripes. Parallelism Lecture notes from MKP and S. Yalamanchili. Robert Colwell R&E Colwell & Assoc. Inc. Thoughts on Comp Arch Futures Why does this guy look so worried? Oh. Programming exercises: Angel – lms.wsu.edu – Submit via zip or tar – Write-up, Results, Code Doodle: class presentations Student Responses First visit. Abstraction, Modularity, Interfaces and Pointers Original slides by Noah Mendelsohn, including content from Mark Sheldon, Noah Daniels, Norman Ramsey COMP. Parallel Programming and Algorithms : A Primer Kishore Kothapalli IIIT-H Workshop on Multi-core Technologies International Institute. 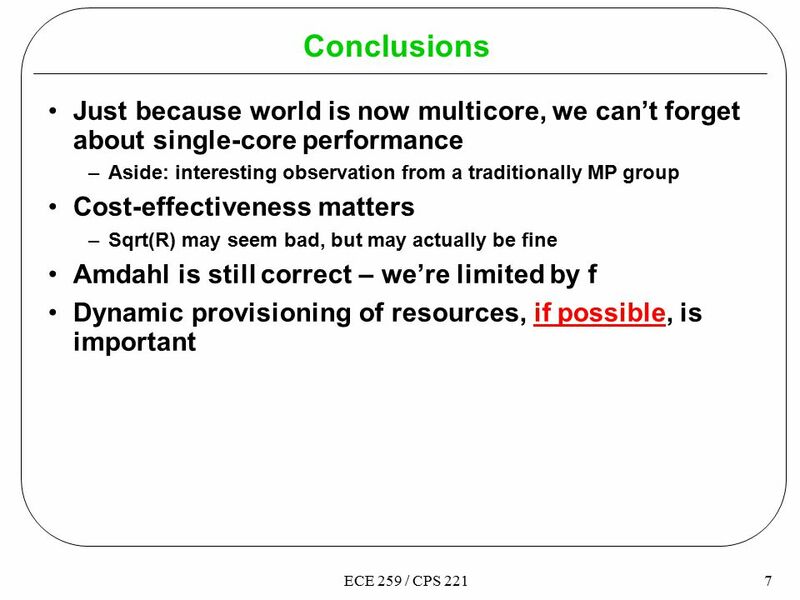 (C) 2001 Daniel Sorin Correctly Implementing Value Prediction in Microprocessors that Support Multithreading or Multiprocessing Milo M.K. Martin, Daniel. PradeepKumar S K Asst. Professor Dept. of ECE, KIT, TIPTUR. PradeepKumar S K, Asst. Lecturer: Simon Winberg Lecture 18 Amdahl’s Law & YODA Blog & Design Review. 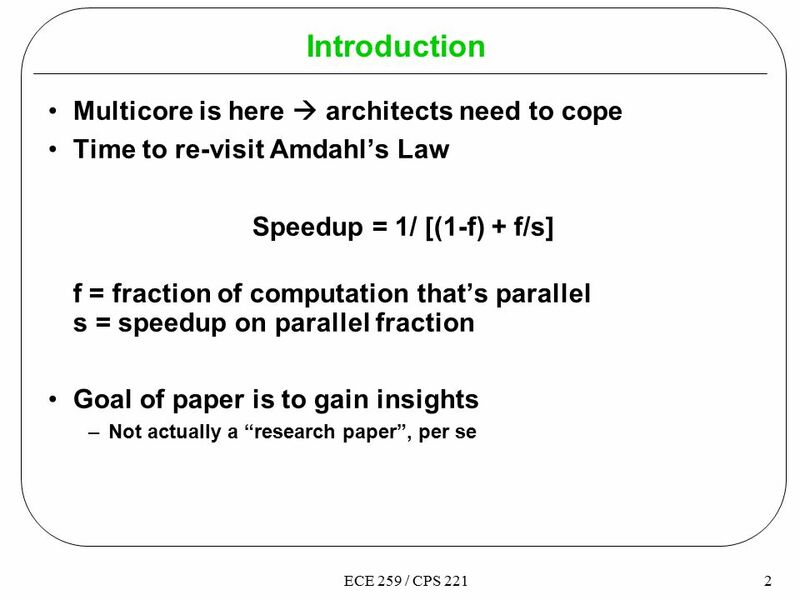 University of Wisconsin-Madison © 2008 Multifacet Project Amdahl’s Law in the Multicore Era Mark D. Hill and Michael R. Marty University of Wisconsin—Madison. - Sam Ganzfried - Ryan Sukauye - Aniket Ponkshe. Outline Effects of asymmetry and how to handle them Design Space Exploration for Core Architecture Accelerating. Arquitectura de Sistemas Paralelos e Distribuídos Paulo Marques Dep. Eng. Informática – Universidade de Coimbra Ago/ Quantitative. Dynamic Thread Assignment on Heterogeneous Multiprocessor Architectures Pree Thiengburanathum Advanced computer architecture Oct 24, 2007 1.